It was 21st Feb 2015 when I landed at Indira Gandhi International Airport Delhi with my every beat of heart I was thinking about her, how she will be greeting me , what would be her reaction seeing me (in person) for the first time, rather i was also having the similar kind of feelings for myself. I still remember it was some time around 13th Nov 2014 when I had spoken or rather seen her on Skype for the first time. From what I have known her till that time, She had been a dedicated “Kaur” since her childhood while I was preparing myself to be called as a “Singh” which would be after taking Amrit (getting baptised). I had given my life to Sikhism just over a year before we met, and I had lived according to the world’s standards for my first 30 years. 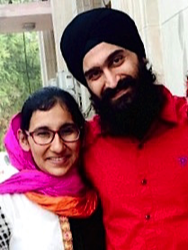 And this is not the end of the story, this is just a beginning of a new life of a “Singh and a Kaur”. Along with WaheGuruji’s Blessings “Gursanjog” . There have been few people who have contributed to our story and my special thanks and regards to Rajender Singh Gabbi , Jaspreet Kaur Gabbi, Satwinder Singh Gabbi who have always been involved in all the phases of my Beautiful and Spiritual life with Agam. I Love You All !! Thank you so much for visiting! This is the place you'll find every piece of information regarding our "Anand Karaj" (wedding celebration) which is on June 07, 2015. We are so excited to be spend this special time with friends and family we hold so dear to our hearts. Our wedding will be taking place in beautiful Delhi City. We have both always loved the city views and couldn't think of a better place to celebrate this special occasion. So mark your calendars because we would love for you to come celebrate with us! Agam and Me (Rajat) are waiting for this auspicious day and we hope you will join us in each step we take as we come closer to our big day.